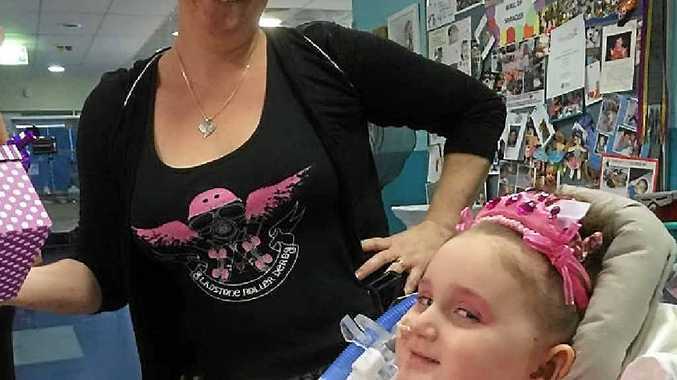 "CAUSE I am a champion and you're gonna hear me roar," sang four-year-old Abi Wilkinson in hospital in Brisbane. The lyrics she recites to her favourite Katy Perry song are enough to make her family's eyes swell with tears. The little girl is still adjusting to life as a quadriplegic months after a horrific head-on collision in Logan on April 4. Despite now breathing through a tracheotomy, Abi is conquering every milestone, ringing true the words in the song. Mum Tanya Wilkinson is ecstatic at the progress her youngest child is making. "Our girl has finally found her independence again," she said. "She may never walk again and she will be on life support to breathe for the rest of her life, but when she's just had enough she can turn around and roll away in the opposite direction, telling us to leave her alone. "She has found some control and she is absolutely running with it. "I could not have been any more proud of her. She can do anything she sets her mind to. "It's just going to be done differently." Abi has been undergoing regular music therapy sessions, and as she listens to 'Roar', she sings along.